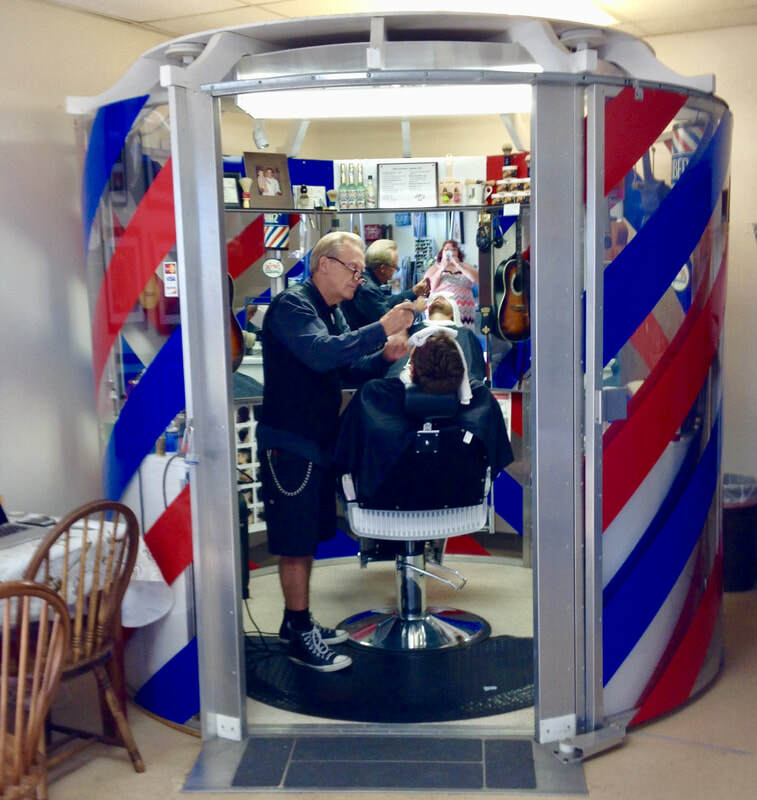 The Barber Stop is eight feet in diameter. The height varies between eight and thirteen feet tall. At the present, there are two options; an open top and a geodesic dome top. The open top option is 8 feet tall. The dome top option is thirteen feet tall. Host locations with low or "drop" ceiling heights require a Barber Stop with no top. There are other reasons to choose a Barber Stop with no top. You will learn more about that when placing your order. 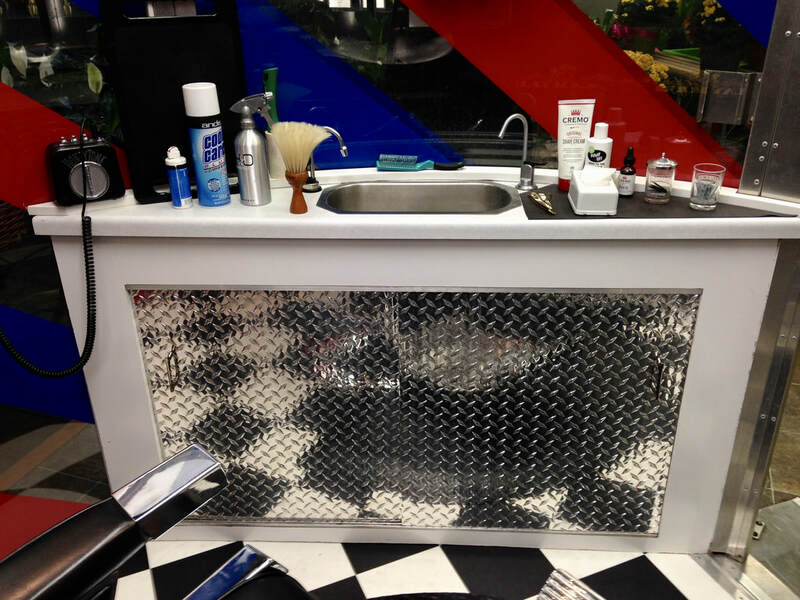 The framework of Barber Stop is made of aluminum and stainless steel. 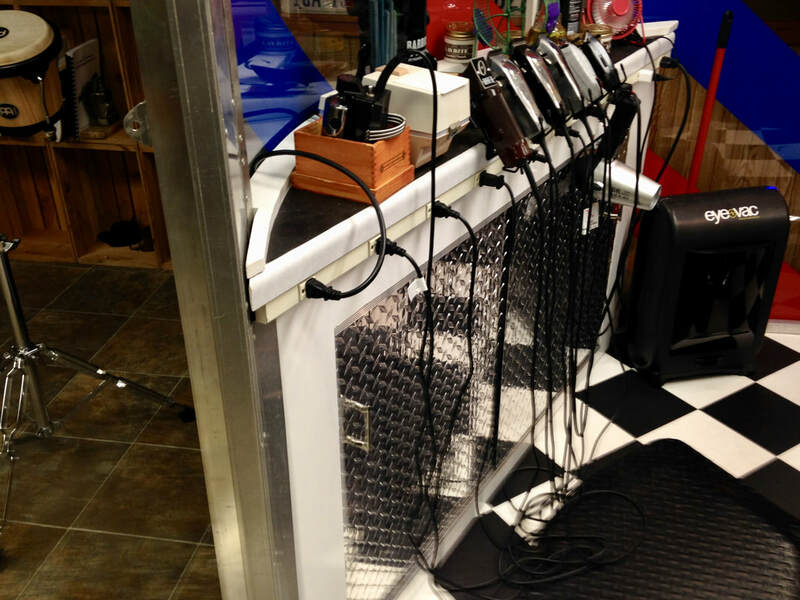 This gives the Barber Stop a very high-tech look and all but guarantees the shop will last forever. The first Barber Stop shops were built and put into service 12 years ago. Those units look as good today as they did when they were brand new. The clear, outer structure of Barber Stop is made of clear Polycarbonate. Polycarbonate is well known and widely used for several reasons. First, it has extremely high impact strength for a plastic material. This makes it an ideal choice. Also, Polycarbonate allows light to pass through it very easily. The barber pole stripes are made of the same materials used to apply company names and advertising messages to vehicles. 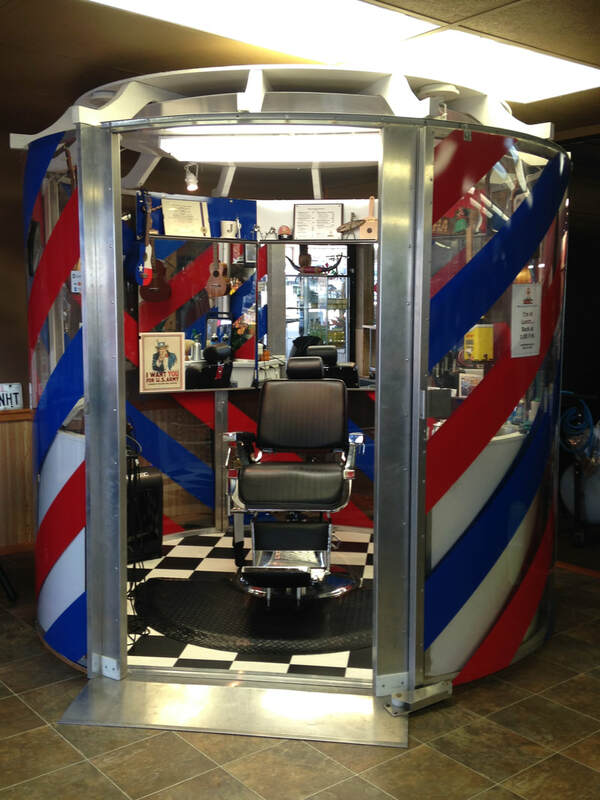 Barber Stop is equipped with a rolling and locking door system. At the beginning of each work day, a padlock securing the door system is unlocked. This frees the door so it can be rolled out of the way allowing entry. This preserves the barber pole appearance at all times. The Barber Stop is equipped with an ADA (Americans with Disabilities Act) compliant threshold to accommodate wheel chair customers. You can see it just outside the entry way of the Barber Stop. A "no-shadow" lighting system is built into Barber Stop. This enables barbers to see hair well enough to do perfect haircuts every time. L.E.D. 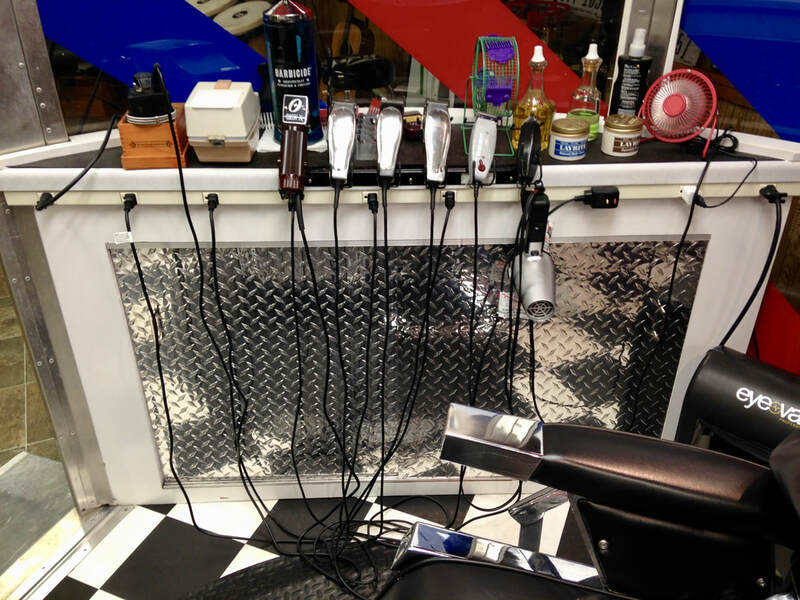 lights are used in the Barber Stop to apply maximum light with a minimum of heat generated. Barber Stop barbers cut hair with customers looking directly into a 3-way mirror system. Positioning customers to watch your work gives them a great deal more confidence in your abilities. It also gives customers a 3/4 view of their own head. The mirror system gives barbers a full view of the clients' entire head while standing in one position. This is a tremendous time saver. Barber Stop is equipped with a set of overhead shelves. There are three shelves positioned just above the 3-way mirror system to make them clearly visible to clients while seated and serviced. 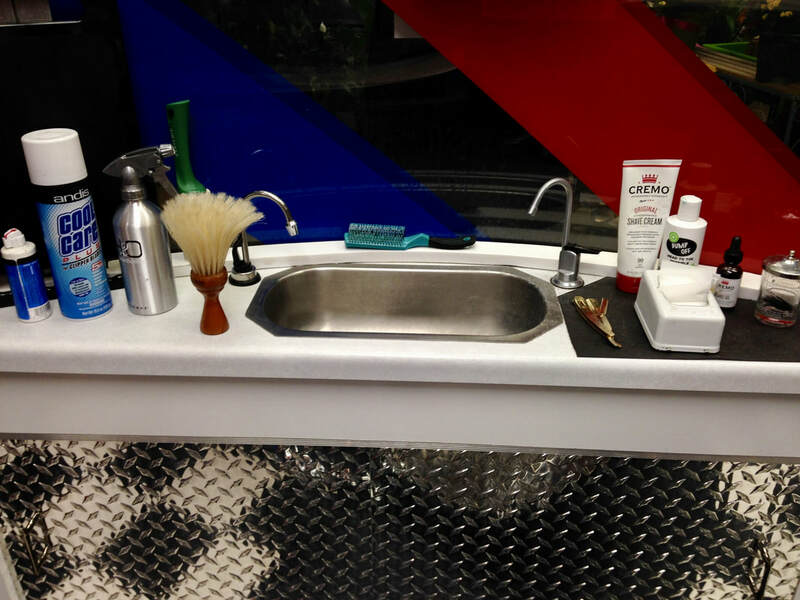 Self-contained hot and cold running water is a key feature of Barber Stop. Without it, traditional plumbing would have to be run to and from each Barber Stop location. This is way too costly. Costly modifications such as these run cross-grain to the Barber Stop philosophy of keeping investments low and agreements flexible. Neither you nor the host company know how the arrangement is going to work out. There is no reason to complicate your relationship with unnecessary costs and risks. Barber Stop is designed to be plugged into a standard 110-volt wall outlet. This is sufficient power to drive the 10 plug-in, outlet strip, "no shadow" lighting system and everything else in the shop. No additional electric power is needed. Barber Stop has two cabinets and counter tops; one on either side of the shop. One of the cabinets holds the self-contained plumbing system, sink and faucets. The other cabinet is used for supplies, storage and towels. Each cabinet has two sliding doors to hide the contents. The sliding doors are made of chromed diamond plate steel with handles attached. 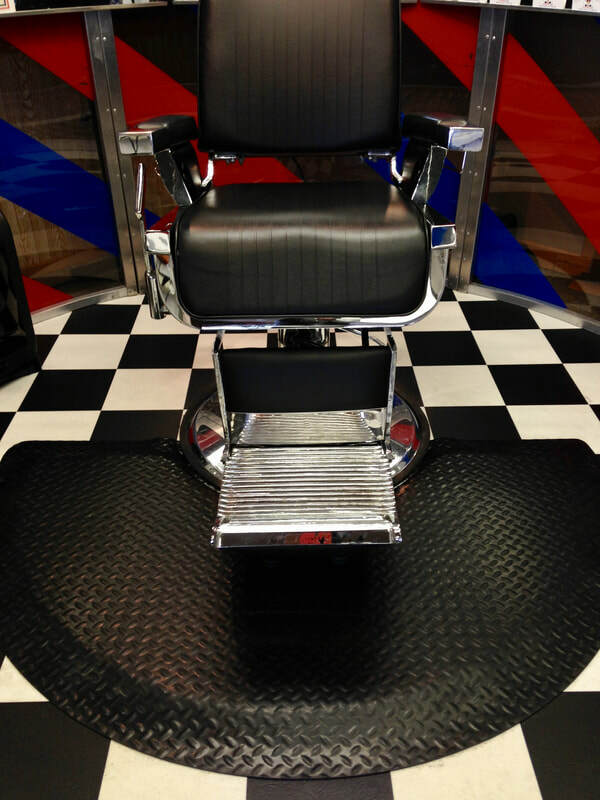 Barber Stop has a vinyl flooring system in the traditional barber shop black and white checkerboard pattern.